Although I have always had a rooster, hatching chicks from my own flock never struck me as a practicable option, largely because my hens rarely go broody (just twice in twelve years) and going the incubator route just seemed a bit too mechanical. Maybe even a little Dr. Strangelove-ian, because, after all, the reason we even have to consider using incubators is because poultry breeders have bred out just about all of the traits that keep a chicken from being anything but a super egg-laying machine. In other words, all eggs, all the time. No time to sit on a nest and brood a clutch of eggs. Thus to some extent, my studied indifference to using an incubator to replenish my flock was in no small part a silent (and admittedly ineffectual) protest of this manipulation for commercial gain. Irrational? Absolutely. But not nearly as irrational as the reaction I had today when my friend emailed me that five of the 12 fertilized eggs I had given her to incubate had hatched. “That’s my Roo!” was the first thought that popped into my head, quickly followed by a peculiar sort of elation that the eggs had turned out to be viable, and that my little flock was, well, actually reproducing instead of just producing. And this led me in turn to mull over once again what our cultural tendency to measure value through its rate of return on investment costs us in the long run. Flock reproduction really shouldn’t have to be a planned event, such as this one. Not that long ago, backyard flocks reproduced willy nilly: there were eggs to eat, new chicks to replenish the flock, older hens and extra roosters to eat. But somewhere along the line – from our grandparent’s time to now – the natural occurrence of flock self-sustainability has been eroded to a point of near-disappearance. That this hatch is an orchestrated event this spring, rather something which happens in its own course and with natural regularity (as it does in other parts of the world with less manipulated breeds) emphasizes this point. Like all birds, chickens molt to replace their feathers, and sit on eggs to incubate, hatch and propagate their species. Because these biological phenomena remove a hen from egg production for the duration of the event, these are increasingly seen as highly undesirable traits in laying hens – especially broodiness, which can remove a hen from egg production for several months. While some breeds are more likely to be broody, especially among heritage breeds, many of our most popular and hardy egg layers no longer have sufficient inclination to hatch their own. Thus, we have ended up with many chicken breeds dependent upon human intervention for successful reproduction. This is a biological kluge that should make us nervous and cause us to question the wisdom of valuing layers only in terms of their maximum egg output. 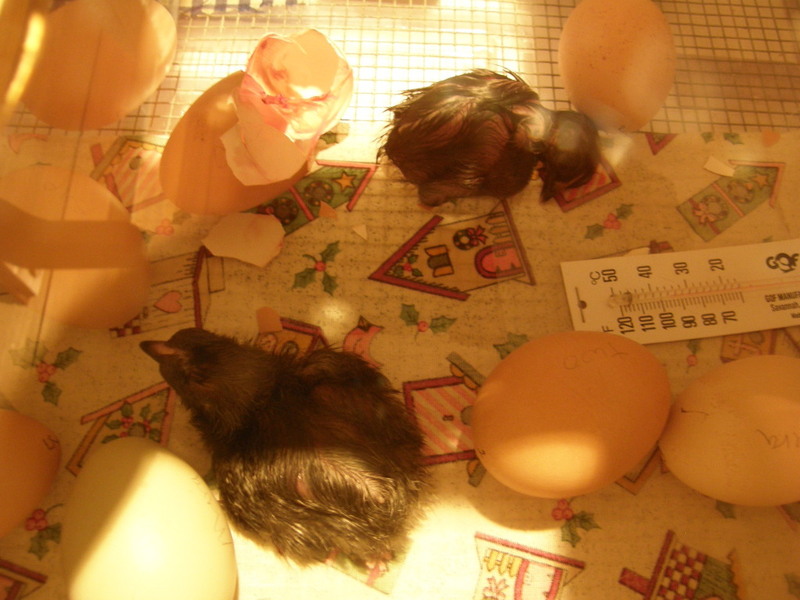 This entry was posted in Chicks, Flock, Opinion and tagged broodiness, chicks, hatching, hens, incubators, molting. Bookmark the permalink.